5/22, 5/24, 5/29, 6/9, 6/10, 6/12, 6/17, 6/18, 6/19, 9/4, 9/16. Jason Politte and I intercepted a fast-moving squall line along I-30 near Greenville, TX. The highlight arrived around 4pm when the sky turned ominously green while a shelf associated with a line echo wave pattern approached from the west. As the line neared, a rain-wrapped meso became noticeable to the northwest with a strong RFD punching around and quickly occluding the area of rotation. After filming for three minutes, we blasted east on I-30 but were brutally overtaken by the squall. We tried for several miles to pull ahead but to no avail due to hydroplaning and the ~70 m.p.h. winds battering the area. Several structures were reported damaged north of Greenville where we observed the line echo wave pattern and embedded meso. (Video capture courtesy of Jason Politte). With the lack of speed and directional shear, we certainly didn't expect anything significant, but with a strong cold front pushing in and modest instability, Jason Politte and I decided to target northeast Arkansas. The first storm observed near Cave City, AR displayed brief supercellular characteristics as a lowering/psuedo wall cloud developed and persisted for a few minutes before being heavily affected by outflow and engulfed in precip. With the Cave City cell weakening, we shifted our focus to White County and a developing storm in the prefrontal convection associated with the moisture axis. A severe warning was soon issued for the cell as it pushed off to the southeast. Towards sunset, the storm turned a hazy orange with an odd display of crepuscular rays opposite of the sun and a fairly intense display of lightning. We pulled ahead of the cell east of Des Arc and observed the lightning-illuminated storm bowing outward before ending the day near Brinkley. FULL ACCOUNT AVAILABLE. Jason Politte and I intercepted our first supercell south of Elk City, OK. The cell displayed intense rotation at times before producing the first tornado, a beautiful translucent rope, southeast of Butler near 3pm. The second tornado with the cell occurred thirty minutes later north of Custer City, OK as we punched through the south side of the hook and observed the tornado from close proximity as it dissipated. One last, brief tornado was observed near Thomas, OK. We eventually broke off the cell near Hitchcock and moved to intercept a newly developed supercell near Weatherford. We followed the cell to south of Okarche where we observed our third tornado of the day. The storm provided an unusual display of tornadic activity with a large pointy funnel and a smaller, more laminar horizontal funnel stretching to the south. A fantastic early season chase. Mike Efferson and I arrived in Marshall, TX at 4pm, as a rapidly developing storm was observed to the immediate west. The storm quickly became a supercell as it moved to the east around 30mph. We pushed closer along Hwy80 west of Marshall and stopped with a good view to the west. By 4:40pm, we had a clear view of the storm as it moved over Hallsville. The storm structure was quite impressive, complete with a persistent wall cloud and pretty vault. The storm continued to organize and large scale rotation was evident. Unfortunately, a left split from a storm to the south interacted with the supercell which resulted in the slow demise of the overall organization. The storm certainly made for a pleasant chase day across east Texas. FULL ACCOUNT AVAILABLE. Mike Efferson and I departed Monroe, LA at 10am targeting an area along an outflow boundary north of McAlester, OK. By 3:45pm, an explosive tower developed to the northeast of McAlester. We quickly jumped on the supercell west of Gore, OK along I-40. As the storm was placed under a tornado warning, a large and rapidly rotating wall cloud was observed along I-40 just east of Gore. A tornado appeared very imminent as rotation was intense. The storm eventually evolved from classic to HP as the cyclonic rotation shifted to a forward flank meso. We encountered large hail (2" diameter) throughout the day and ended the day with golfball sized hail in Alma, AR. Departing Little Rock, AR by mid-morning, Mike Efferson and I targeted Eastern Oklahoma. We observed a nice supercell and a tornado west of Haskell, OK around 6pm. The elephant trunk tornado lasted for five minutes and was rain-wrapped at times. We encountered just shy of baseball sized hail ten miles WNW of Haskell before the tornado. We ended the day observing excellent supercell structure. 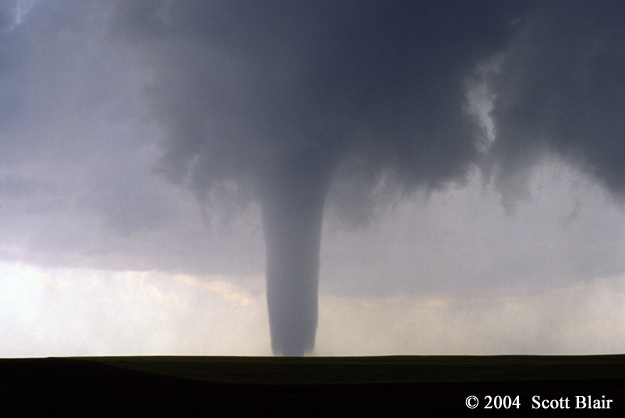 The Haskell Tornado personally marks a milestone of 50 tornadoes observed. Photos Coming Soon A well-defined vort max crashed into an unstable airmass across north Louisiana during the afternoon. I targted near the Ruston, LA area and observed the evolution of a long-lived supercell. The storm contained nice structure with an organized vault and mid-level banding. However, the supercell lacked 0-1km shear and somewhat modified thermodynamic surface instability, so the tornado threat was never persistant enough to produce. I observed 1.5" hail about six miles south of Farmerville, LA. The day ended near Oak Grove, LA observing the backside of a tornado-warned supercell. 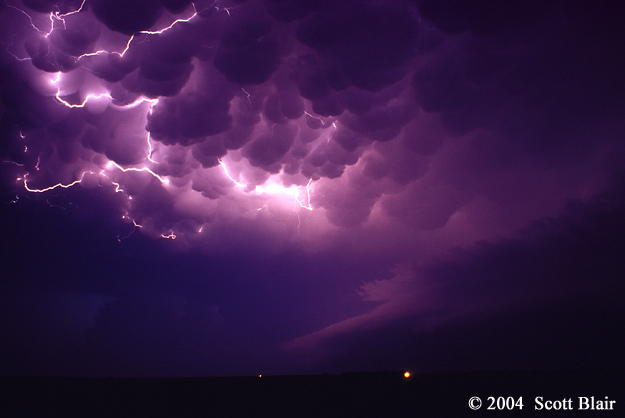 Several supercells exploded across the central plains. Slightly overshooting the target across southwest Nebraska and the complication of limited roads, we targeted a long-lived supercell across northwest Kansas. 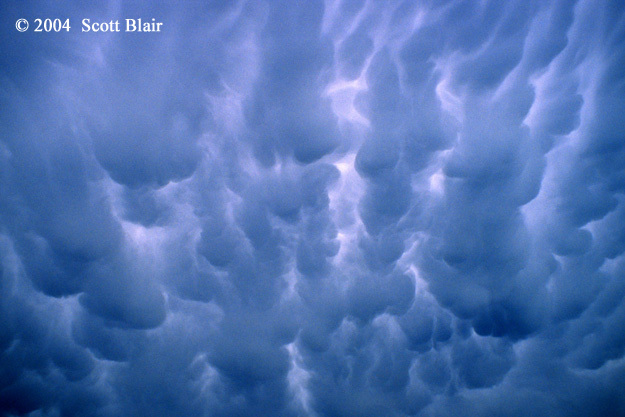 The mammatus and structure was nice and the inflow was in excess of 60mph around 7:15pm south of Gove, KS. We observed two tornado-warned supercells evolve into a line and intercepted 2" hail northeast of Scott City, KS around 8:10pm. A beautiful supercell evolved across north-central Kansas during the late afternoon hours. We first observed the beginnings of a high based supercell west of Russell. The storm rapidly became near-surface based and a tornado warning was issued. Rotation was quite impressive and observed from close proximity. The storm slowly became more elevated with time, but the structure improved with excellent striations and a well-defined vault. The storm died with a pretty sunset near Wilson, KS. Photos Coming Soon After a potentially good setup across eastern Nebraska died due to limited instability thanks to fog, we blasted to central South Dakota to target developing supercells along a cold front. We observed our first supercell north of White Lake, SD around 7:45pm. Several other storms attempted to take on LP characteristics, but both the forcing and instability was insufficent for sustained intense convective updrafts. The chase ended with an excellent sunset combined with decaying cumulonimbus activity. 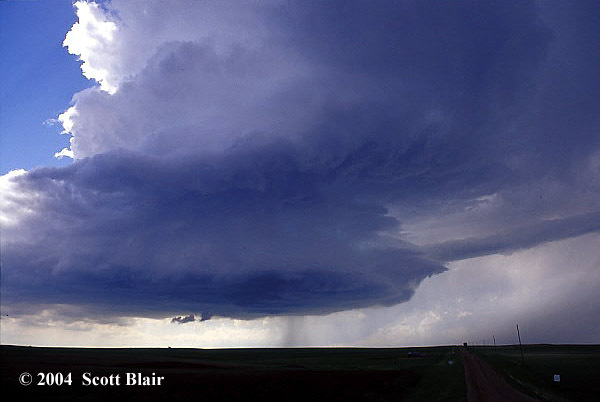 A long-lived dry-classic supercell developed near Rapid City, SD by early afternoon. We intercepted the cell north of New Underwood. The storm contained awesome structure, ranking perhaps in the top 10 best LP structured storms observed to date. Golfball sized hail was observed in the vault of the incredible striated updraft. We continued to follow the cell as it slowly weakened. 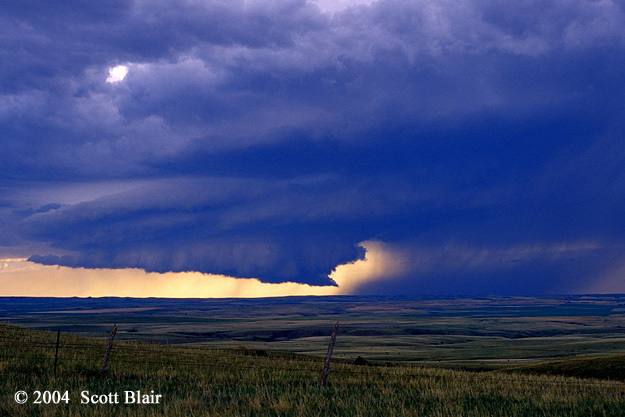 However, two more supercells were observed. The first was near Philip, SD with an explosive updraft and the latter was near Wall, SD. 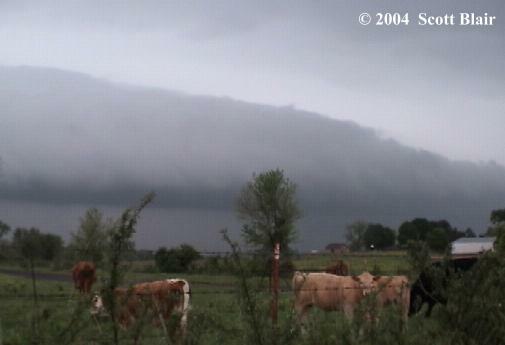 A hail track with hail fog was noted with the Philip supercell. We ended the day near Kadoka, SD watching mammatus fill the eastern sky. An outbreak of severe weather struck Nebraska on Saturday, May 22nd. Jason Politte and I observed a nice supercell east of Alma, NE but were too late for the high contrast tornado near Orleans, NE. Instead, we captured a dust whirl tornado under the updraft near Macon, NE. The tornado lasted for about two minutes before dissipating. We observed some fair structure afterwards before driving into a battering of rain and isolated 2.5" hail. The day ended quite nicely with excellent structure combined with a spectacular night lightning show of anvil crawlers in mammatus near Fairbury, NE. FULL ACCOUNT AVAILABLE. Another outbreak of severe weather struck the midwest on Monday, May 24th. We caught the beginnings of a long-lived tornadic cyclic supercell near Mound City, MO by mid afternoon. Our first observed tornado condensed down southeast of Conception at 4:57pm. The rope tornado quickly lifted and resulted in no damage. 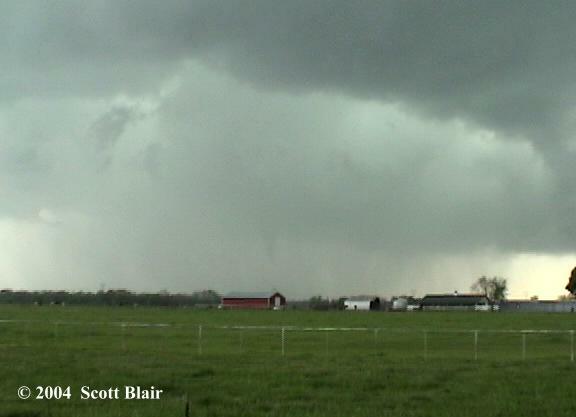 Following the meso eastward, another tornado touched down at 5:01pm about three miles east of Stanberry, MO. The tornado was a brief, high contrast rope and dissipated within a minute. The next tornado developed at 5:06pm four miles east of Stanberry, MO. We observed the multi-vortex tornado at a close proximity of fifty yards while 100mph wind gusts blasted the chase vehicle. The tornado maximum circulation was about 1/10 mile wide and sent debris into the air. After about fifteen minutes, the tornado moved into Albany, MO resulting in power flashes and F2 damage. FULL ACCOUNT AVAILABLE. We captured a supercell near Beloit, KS by mid-afternoon. We positioned just northwest of a strongly rotating wall cloud four miles west of Jamestown, KS. 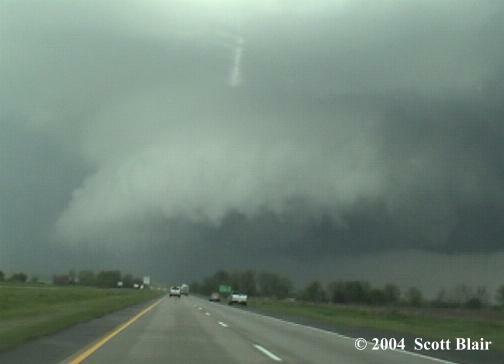 As the meso moved closer, the wall cloud developed a large cone and power flashes were observed. Wrapping rain curtains quickly circulated around the developing tornado. The tornado quickly grew in size, maturing into a wedge with a width just shy of a mile wide. We observed the wedge tornado within close proximity of a mile. We measured 4.5" hail falling on the western side of the meso. As we continued to follow the tornado, Hwy28 contained large tree debris and power poles blocking the road. During the wedge tornado and after taking another route, we observed four more brief tornadoes south and west of the main mesocyclone. The chase ended with excellent structure east of Belleville, KS. Observed one long-lived supercell and five tornadoes across northeast Colorado. We first noticed rapid rotation in a small region under the updraft base and stuck with this feature. Finally, enough tight rotation resulted in our first brief, tube-like tornado as dust shot up into the vortex. Other weak tornadoes were noted with the last one in Sterling, CO just before dark. Power flashes and intense wind were associated with the tornado as it moved into town. FULL ACCOUNT AVAILABLE. An excellent day across southwest Nebraska took place along a dryline punch by mid-afternoon. We observed three tornadoes in Deuel and Keith counties. 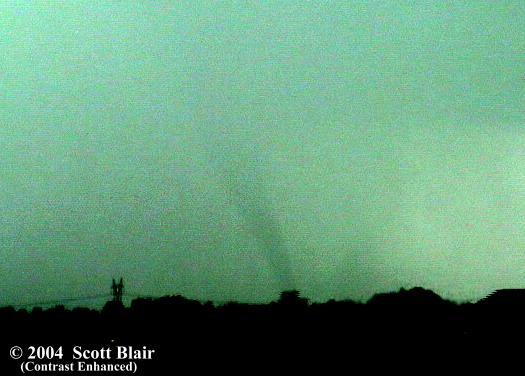 The most significant tornado lasted for nearly twenty minutes northwest of Big Springs, NE. 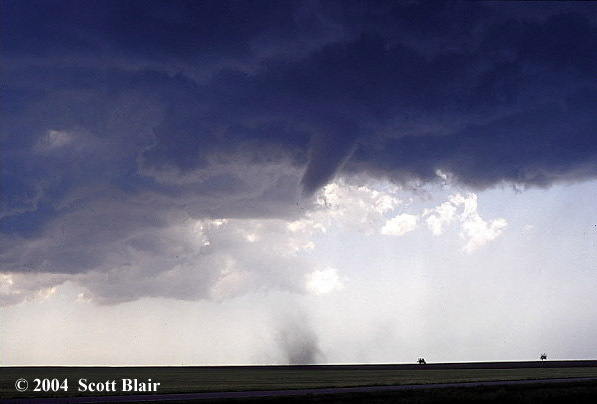 This tornado first started as a large funnel with dust circulating below. As the storm evolved, the tornado became quite strong as numerous vortices whipped about the base of the tornado. Eventually, the tornado roped out within 75 yards of our location, resulting in power flashes and a very dramatic sight. We observed a brief dust whirl tornado under a new meso shortly after the first tornado. The last tornado observed occurred northeast of Lemoyne, NE as a long condensed tornado stretched down for a few minutes. An excellent chase across southwest Nebraska. FULL ACCOUNT AVAILABLE. Perhaps the most incredible tornado day I've observed to date. Jason Politte and I (meeting up at times with Eric Nguyen and Scott Currens) observed four tornadoes southeast of Wichita, KS. 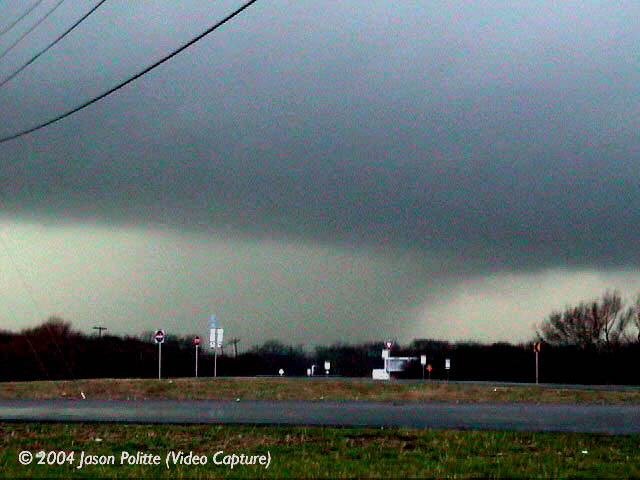 The highlight of the day was the Mulvane, KS tornado observed from very close proximity. 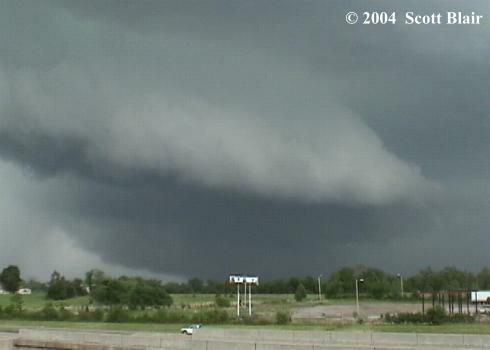 This ghostly white tornado unfortunately affected the southeastern outskirts of Mulvane as a significant amount of debris was noted as this high-end F3 / low-end F4 struck mobile homes and houses with trees lofted around the vortex. At one point, the tornado turned bright white with a vivid rainbow stretching across the sky along with lightning striking nearby. 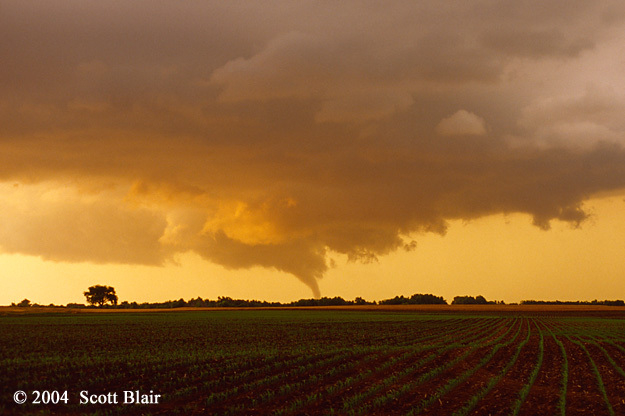 We continued eastward and observed another beautiful tornado at sunset near Rock, KS. We finished the chase observing two more tornadoes at twilight near Wilmot and Atlanta, KS as debris was kicked up under thin tubes. Photos Coming Soon Departed LIT at 02z, made a stop and departed near GGG at 07z, arrived at OKC around 15z and departed shortly after to chase in eastern Colorado. Needless to say I had no sleep, so big thanks to chase partner Eric Nguyen for driving my incoherent self to Colorado. We observed a developing tower near Trinidad, CO that meandered northeastward for several hours. This storm finally exploded near Las Animas, CO and was placed under a tornado warning south of the John Martin Reservoir. We observed a nice, sustained wall cloud with intense inflow winds. The storm eventually became rain-wrapped and we lost all visibility. Tired and exhausted, we ended the day before sunset and stayed the night in Pueblo, CO. Photos Coming Soon We targeted Raton, NM and observed an explosive tower just south of Raton around 19z. We followed the storm for several hours, nearly becoming stuck on poor back roads and observing small hail. After struggling for hours, the storm finally became an excellent supercell containing classic structure around 23z. The storm remained classic for nearly an hour before the convection became more linear in nature. We observed a decent lightning show after the storm passed in the Texas Panhandle. The image was taken from the sixth floor of a parking garage in Monroe, LA. The photo was shot with Kodak E100VS slide film using a 28mm lens. 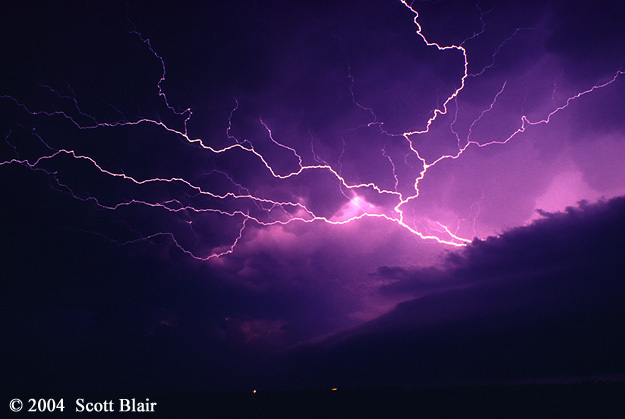 It was especially challenging to correctly expose the existing light to reveal both storm structure and lightning. The lightning struck an oak tree approximately 900 feet from my location, enabling the fine detail observed in the photograph. The bolt originated well away from any precipitation core, although light rain was present. 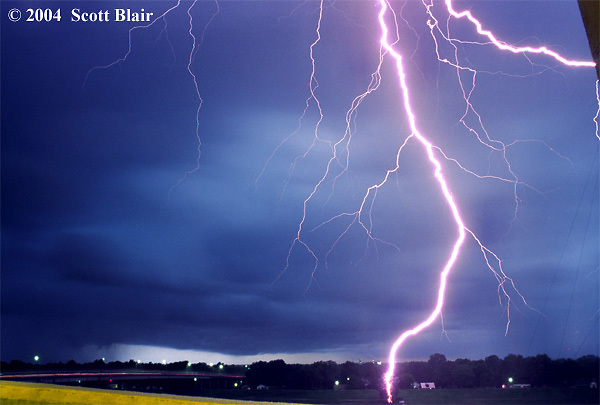 The lightning is actually forked lightning, where two dart leaders exist resulting in two strike locations. The first obviously is the large oak tree near the bottom center of the image with the second just off the right frame. Closer to the ground, two failed stepped leaders can be observed reaching towards the surface. FULL ACCOUNT AVAILABLE. We departed Monroe, LA on the evening of September 1st and arrived along the eastern Florida coast the evening of September 2nd. We deployed our first tower on the barrier island near Floridana Beach around 8pm on September 3rd. The second tower was deployed during the early morning hours of the 4th at the Fort Pierce airport. I chose to first setup to photograph Frances along the barrier island east of Fort Pierce, FL. By midday, significant waves and gradual storm surge pounded the island. Signs and power lines soon failed across the area. Significant damage to structures was observed by early afternoon across the barrier island. Large debris became airborne from failing structures as strong squalls and the western eye wall of Frances entered the area. The intercept was successful and both towers recorded impressive data. Photos Coming Soon Observed Ivan south of Mobile at Theodore, AL. Minor damage was observed with numerous power flashes and large signs down. Overall, areas west of the bay lucked out from any significant damage with the exception of the north side of Dauphin Island. Deployed two meteorological towers at Mon Louis, AL and Dauphin Island, AL. The Mon Louis site was about 10 miles south of Mobile, directly on the bay. The highest wind gust recorded was 74mph with highest sustained winds of 62mph. It's a confident assessment that areas of metro Mobile didn't experience any hurricane force winds at the 2m surface (unless winds were funneled by objects). The lowest pressure recorded came with the Dauphin Island site of 945mb.